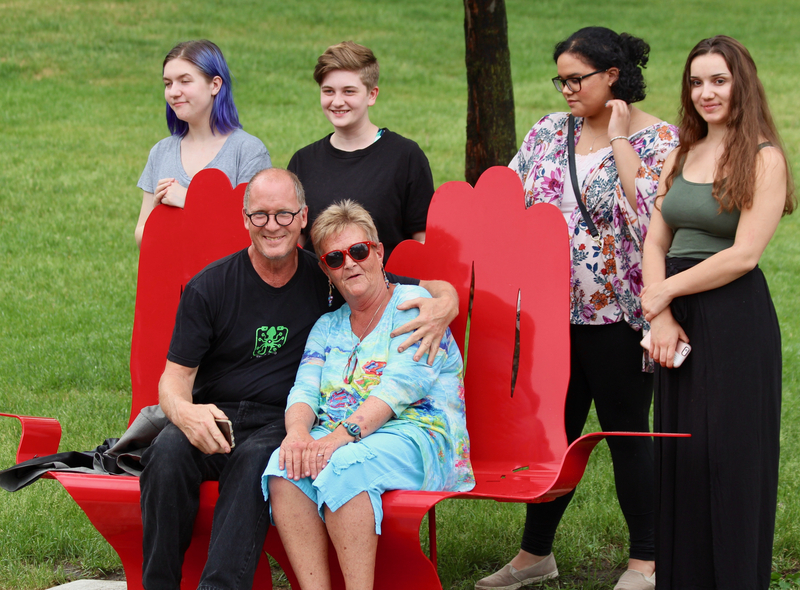 This bench will honor long-time St. Croix Valley Red Cross leader Jan George, showing two hands together, representing how the people in the river valley have, throughout history, depended upon one another and come together to lend support. From downtown Stillwater: Take Myrtle Street west from Main Street for one block. Turn right on Second Street and drive approximately five blocks to Pioneer Park, on the right side. Bench is along the path near the playground. A pair of hands planted in Pioneer Park offers a spot to sit and rest and contemplate a view of the St. Croix Valley — the bench’s inspiration and creation offered even more. 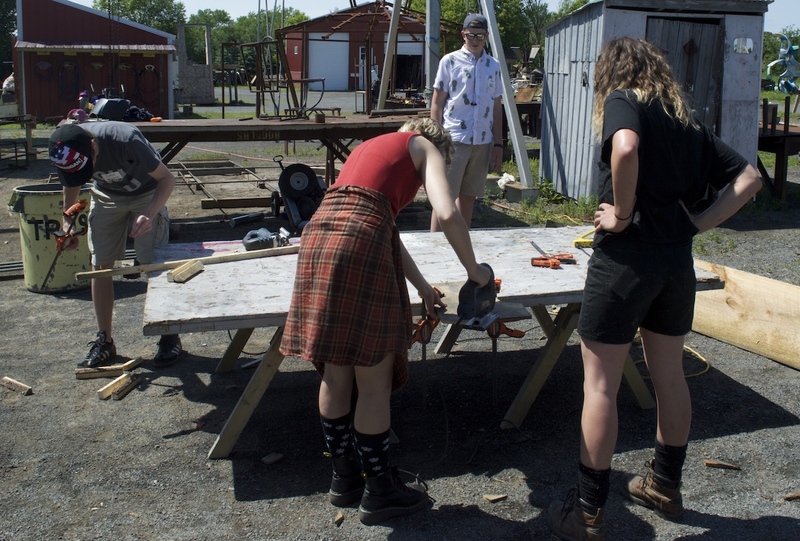 Working on the new Stillwater Art Bench project opened the eyes of 13 student artists to their hometown, and to the people who care for their neighbors. The bench is dedicated to longtime St. Croix Valley Red Cross employee Jan George, and celebrates her career of helping people, and her belief that we are most effective when we work together. It was Jan who suggested the bench include joined hands, as a symbol of teamwork and cooperation. It was the middle schoolers, and artists and teachers working with them, who brought the bench to reality. “Together we make a difference, alone we don’t,” Jan says. Just like Jan wanted the bench to celebrate the many people in the community she had worked with, the students practiced collaboration to come up with a design. They wrestled over competing ideas, driven by their goal to celebrate somebody who inspired them from the moment they met her. Through Jan’s eyes, and many stories, and adventures throughout the St. Croix Valley, the group gained a new appreciation for the place that is their home. Jan’s connection to the Red Cross spanned six decades. In 1969, she donated blood to help her father during open-heart surgery. She was so inspired by the other people giving blood to strangers that she started recruiting donors to the Red Cross. The rest is history. A lot of very interesting history. After her introduction in blood donations, Jan quickly worked her way up to Youth Services Director, and then the Community Services Director, of the St. Paul Chapter. In 1990, she became Executive Director of the St. Croix Valley chapter. During her decades of service, Jan responded to national emergencies like hurricanes and terrorist attacks, and local disasters like floods and house fires. Through it all, Jan brought comfort to people during some of the hardest days of their lives. In 1998, she brought closure to the family of Red Cross worker Harriet Gowen, who was from Stillwater and disappeared in New Guinea in 1945. Jan helped bring her remains home to be buried when they were finally found. Her work came to an end in 2014, when the national Red Cross organization consolidated many chapters and closed the St. Croix Valley chapter. Jan retired after 45 years, still sooner than anticipated. 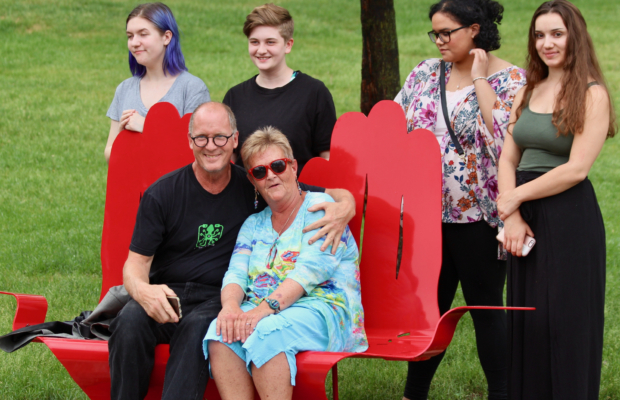 Because Jan was a key part of Stillwater and the surrounding communities for many years, the participants also wanted the bench to tell something of the story of the St. Croix River Valley. For that, they set out to explore their own backyard. Over the course of four weeks during summer vacation, the students conducted local history research, went on adventures, tried out sculptural techniques, and discussed the design. They began to develop the interconnected forces that shaped their complex communities. “Through visiting the St. Croix Watershed Research Station and diving into the history of Stillwater, I learned a lot about how the river as a resource has shaped the communities around it,” said student Tate Johnson. The students wandered Franconia Sculpture Park’s 40 acres filled with artwork large and small, as well as working sculptural studios. The students created individual molds for a hot iron pour later in the summer, and heard from working artists about the challenges of creating three-dimensional art. 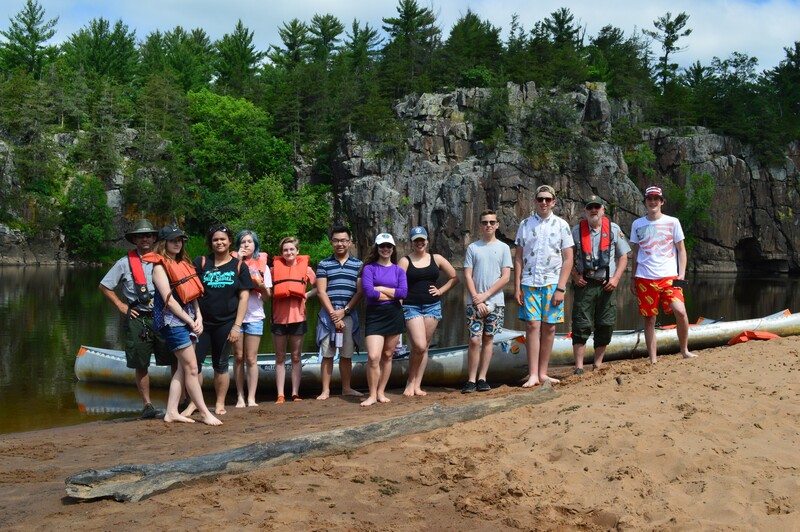 And the students canoed down the St. Croix River. National Park Service ranger Bob Downs held them spellbound talking about the river’s ecology, geology, and history. 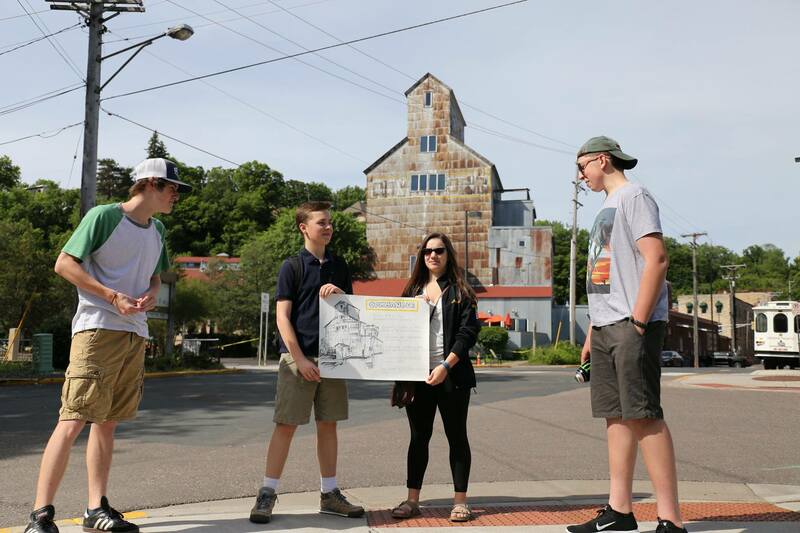 The students also designed a historic walking tour of downtown Stillwater, with pairs presenting to their peers different sites and stories, and took a trolley ride to learn more about the community. Kids who had spent their whole lives in Stillwater felt like they finally knew the value of their hometown. Ultimately, the students learned so much, they had too many ideas. The group had to make the hard decisions about what to keep and what to cut, to keep the bench design simple and inviting, an original goal of the project. The students looked to Jan’s example to guide those choices. She inspired them to listen to each other, and strive to design something that would honor her spirit. “There were so many great ideas from all of our group members, I think the biggest challenge to me personally was making something that reflected all of our great ideas,” says student Tate Johnson. Artist Julia Kaemmer helped guide the work, and spent many hours listening and mentoring the students in the art room. She said she could see how the space and the kids became a community in themselves, a creative camaraderie. That sense of togetherness was essential when it came time to narrow down the ideas. After all, this was a group project, with no single person making unilateral decisions. The students kept returning to several key values to work through their differences. When the students decided on the hands as the main shape of the bench, their own hands were used for inspiration. Over the course of the project, the group got a stronger sense of what they could do for their community and their future. 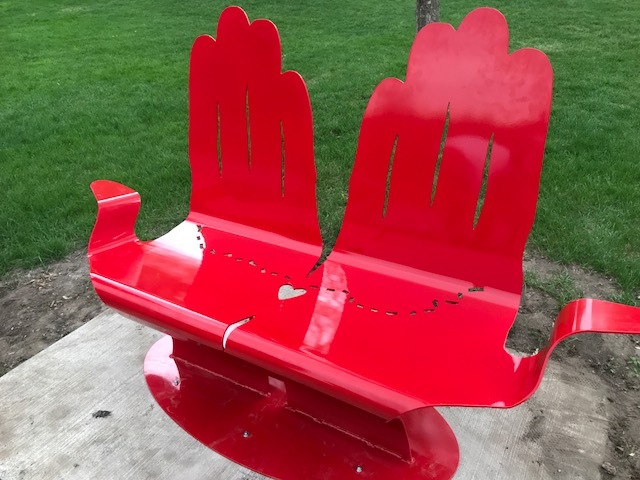 In addition to the connected hands, the bench features a cutout representing the St. Croix River running across the palms like a lifeline. It even provides a practical benefit, draining water from the seat after rain. Sculptor Allen Christian joined the project to finalize the design according to cost and material considerations, and produce the finished product. Christian saw how the students engaged with Jan, each other, and the project and how they understood the power of cooperation. “I think anytime you’re involved in the creative endeavor, seeing an idea manifested and resulting in a physical object that now is within the community space, I think all those kids on that level will be able to go there and say on some level ‘we collectively created this,’” Christian says. The students also represented something Jan had always believed in: the ability of young people to contribute and lead. The Red Cross St. Croix Valley Chapter had four youth members on its board of directors, involved in all aspects of the work. It was unique in the state of Minnesota for giving kids the power to vote on key decisions. Jan’s work came to an end four years ago. She says she is still looking for a sense of purpose to replace it. But the bench project gave her hope that the future is in good hands. Designed in 2016 by Stillwater students Bella Anderson, Mia Eliasen, John Finney, Tessa Johansen, Tate Johnson, Nick Nguyen, Belle Rhoney, Lilly Sample, Mac Schlenker, Hannah Sween, Clarice Vrambout, Keenan Walker, and Eleanor Wilhelmi, with art teacher Megan Beadle and local artist Julia Kaemmer. Final design concept developed in 2017 by students and artist Allen Christian. Funded in part by Andersen Corporation, Fred C. and Katherine B. Andersen Foundation, Hugh J. Andersen Foundation, HRK Foundation, SRI, and St. Croix Valley Foundation. With support from ArtReach St. Croix, City of Stillwater, Franconia Sculpture Park, Leo’s Grill and Malt Shop, The Phipps Center for the Arts, Red Cross Nurses, River Market Community Co-op, Science Museum of Minnesota, St. Croix National Scenic Riverway, Stillwater Middle School, Washington County Historical Society, and Youth Conservation Corps. In honor of Jan George, who served as director of the St. Croix Valley Red Cross for more than 30 years.